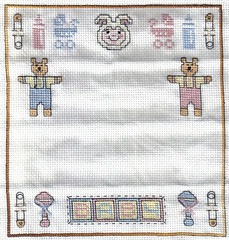 WIP - BIrth record/wall hanger for Baby "Bean"
I have a couple of WIPs (works in progress). This one is almost done. It's a birth record for Baby Bean, my brother-in-law & gf's baby which is due at the end of Oct. It's not far off being finished. I have some buttons, ribbon and dowl to make it into a wall hanging. Then all I have to do is wait for the big day to fill in the name, date & weight, and a little something in pink or blue - depending on what flavour bean baba is. I am using the same theme to make a card for my step-bro & his wife who are also expecting at the end of Oct. They know they are having a boy so that's all blues so far, but no where near as finished as this one so I'll post a pic of that later. I have been to Fabrix in town this week and bought a meter each of some pretty strawberry and cupcake fabrics. I have also bought some tarten fat quaters. So now I have some bits to practice on, and I'm thinking about making a couple of small drawstring bags and drawer scenters as my first sewing machinr project. I'll post how it goes! On a totally different note.... the diet is on hold again. I am constantly hungery and hovering around 13st 2lb anf 13st 6lb. Also Dad is over again this week so dieting will be hard enough. And I fancy doing some baking!! !